In North America, Friday, September 16, 2016 is the Harvest Moon. It is the Full Moon of the Autumn season, and is close to the Autumn Equinox on September 22, 2016. 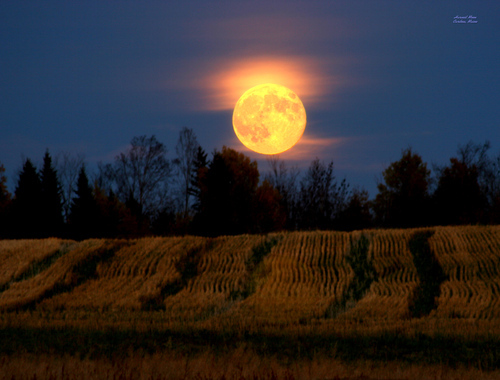 The Harvest Moon is a time of the harvesting of the second crop – all of the root plants – and an important time of storing up reserves for the long, cold winter ahead. In many ancient traditions, it was considered a time of casting spells for prosperity and preparing the physical body to endure the hardship of snow over the landscape. This year’s Harvest Moon is of great importance, as it will also be the last lunar eclipse on a Harvest Moon until 2024, according to National Geographic. Imagine what a change this is for the planet – that a baby born today will not see a lunar eclipse on our special Harvest Moon until the child is eight years old! In North America, we will not see the lunar eclipse, but we can honor it as a shift that prepares the way for the next 8 years. A new level of higher consciousness living is being anchored now, and most of us have been feeling the shifts this past summer (physical, mental and emotional). Three shepherd children of Fátima, Portugal were being prepared in the summer of 1916 for a much greater change for themselves, their community, and the world. Lúcia dos Santos (9 yrs old), and her cousins Francisco Marto (8 yrs old) and Jacinta Marto (6 years old) lived a quiet life in the small town of Aljustrel, a village in the parish of Fátima, about 80 miles north of Lisbon. During the summer of 1916, the children were tending sheep in the hills every day by themselves, and received three visitations from what they perceived to be an Angel. This miracle was so great and touched them so deeply that they did not speak of it to anyone. They prayed the rosary, as instructed, and each one began to change in noticeable ways. Physically, they all felt higher levels of exhaustion after the visitations, and yet, greater peace inside. They each noticed how they were treating their friends and each other, and began to shift to a gentler and more generous nature. 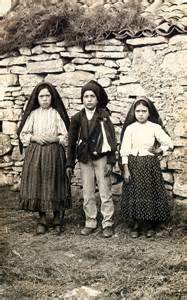 According to the book “The Children of Fatima” by author Leo Madigan, after visitations the children found they could not speak or play or follow a normal routine for a couple of days. They felt as though they were in a daze from the beauty of the Angel and the energy they had felt during the visitation. They were being prepared – the Angel showed up to assist them in raising their vibrations and strengthening their bodies. What were they being prepared for? In the following year, on May 13, 2017, the children received the first of 6 visitations from the Holy Mother, Mother Mary. The Mother prepared them with Light and asked them to tell others there would be a miracle on October 13, 2017. 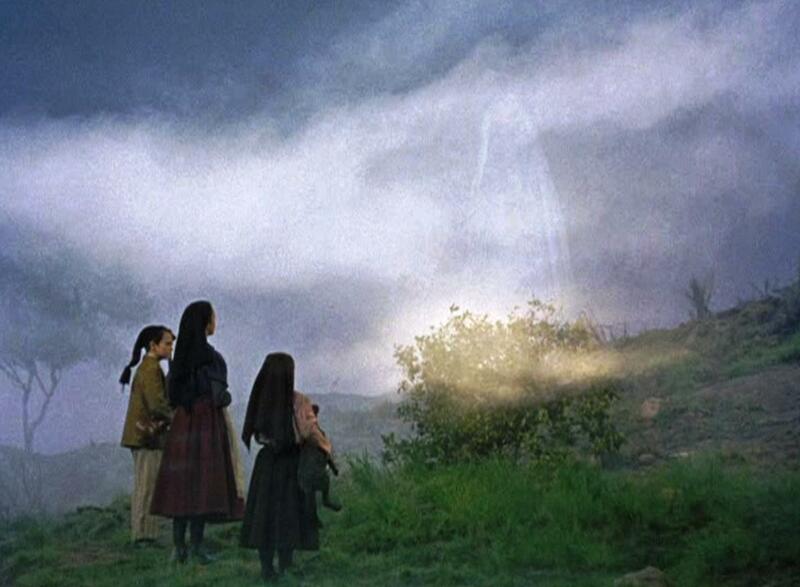 The children obeyed, and thousands and thousands of people began to come to the small town to see the apparitions. Some 30,000 to 100,000 people gathered on October 13th at the Cova da Iria, where the visitations had been occurring for the children. They were rewarded with what is knows as “the Miracle of the Sun.” The rain disappeared and the sun began to change colors and rotate like a wheel in the sky. Many saw this “miracle” from as far as 40 kilometers away, unaware of the happenings at Cova da Iria. Lucia, Fancisco and Jacinta reported that they witnessed Mother Mary, the Christ Jesus and a host of Angelic Beings from the Heavens reaching down and pouring blessings over the masses. What changes have you been experiencing? Over the past summer months, many people have noticed physical changes in their bodies, and a ‘softening’ of their Inner Self. There have been changes in attitude, and ‘sudden’ healings of long-rooted traumas, as though rotted tree trunks and all the root limbs have been yanked out permanently. What have you noticed for yourself over the past 3 months? Are physical ailments now clearing up? The strange pains in hips or the spine or legs are starting to wane? Notice also if you feel more clear-headed, and have received greater clarity on your path. Write down (to anchor the change) if any long-held patterns have cleared, been removed, or transmuted. We are being prepared for a new world – for living at a much higher consciousness level and, just as a square peg will not fit into a round hole, we have been in need of adjustments. What will not work in the higher vibrations must go, and so it may have been shed gracefully or with a bit of what felt like blunt force. What we know is that it is in preparation for a substantially more graceful way of living. We have the God-given power to speak anything into manifestation. Know that this is increased when you cross into living at a higher frequency of committed authenticity of the Higher Self. Divine LIGHT will be shining forth from you like a beacon in a Lighthouse, as we manifest with positive intention and attract people and situations that flow easily with our life path. So for tonight, enjoy the Harvest Moon! Bring out your bowls of fruit, candles and lanterns and speak out the powerful words of prayer and blessings over yourself, your family & friends, and the global community. Thank Mother Earth for her beautiful support, day in, day out, and know that you have been strengthened to thrive in this winter season, and blossom over the next 8 years!